On Monday, it’s Dr. Seuss’ birthday, which is undoubtedly one of my favorite days of the whole year. I am a Seuss fanatic — a Seuss-ologist, if you will. My independent research project during my senior year of college explored the influence of the language use of Dr. Seuss on students’ comprehension and I am constantly seeking ways to incorporate Seuss-ian texts into my classroom. 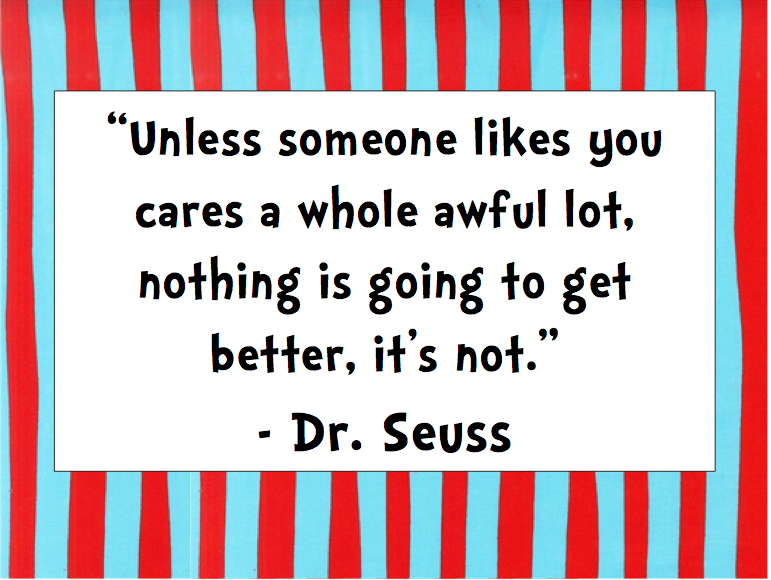 In fact, the current unit my students and I are working on is about Dr. Seuss, poetry, and is focusing more specifically on The Lorax and environmentalism. Teachers are often told to “teach what you’re passionate about,” and the beginning of this unit has illuminated the wisdom of that statement. I feel myself being more excited, more enthusiastic, and ultimately, more engaging, when I am talking about Dr. Seuss and his work with my students. They seem eager to listen, to ask questions, and to be around the positive energy that I feel emanating out around me. Right now, I’m not feigning energy and passion, as I sometimes do with other, more mundane topics that are the sort of necessary evils that you have to teach but that are just impossible to get enthralled and swept up by. My excitement is authentic, it’s genuine, and my young students notice. I’ve also found that it’s considerably easier to be creative and to exercise risk when you have passion for what you’re teaching. 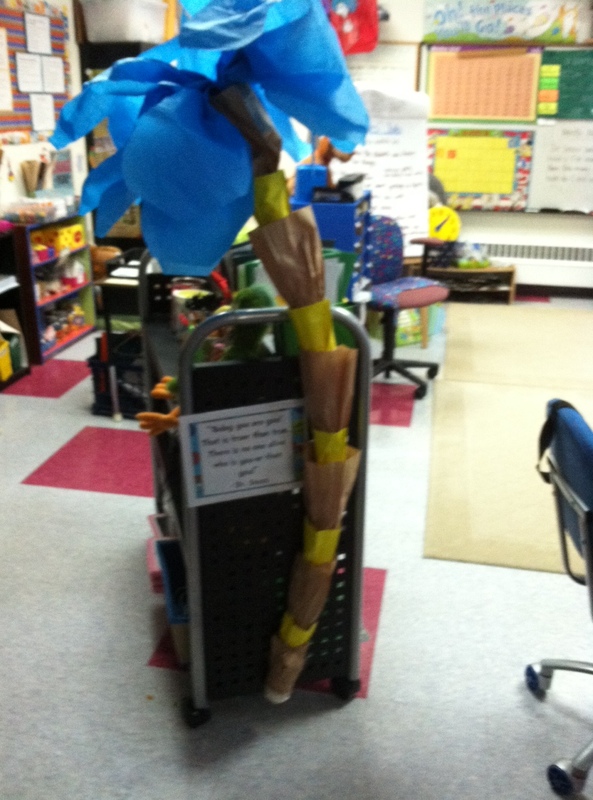 One of the major tasks that my students will work on in our Dr. Seuss unit is a theatrical adaptation of The Lorax. 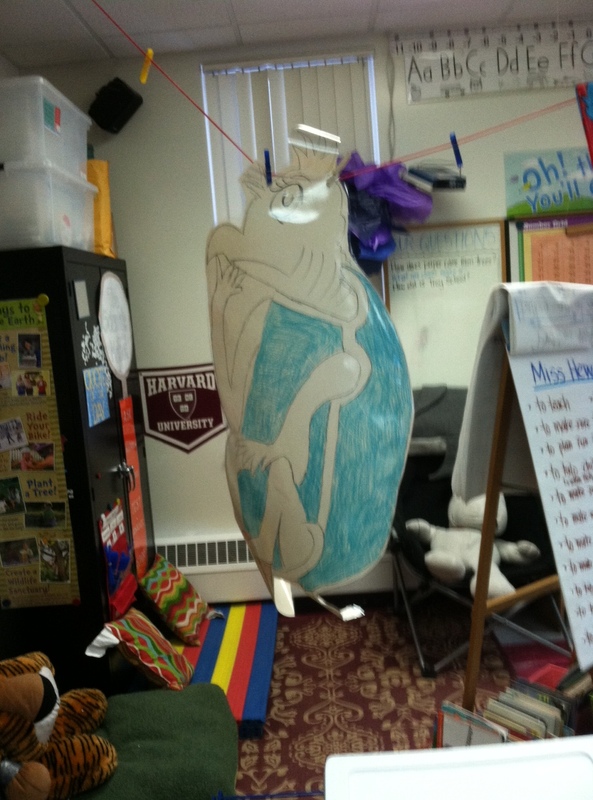 Now, last year, when I did my Dr. Seuss unit, my students worked in their guided reading groups to create mini-plays, based on their understanding of The Cat in the Hat, The Butter Battle Book, and Horton Hatches the Egg. This, too, was a risk, but nothing on the scale of what I’m endeavoring to pull off over the next several weeks with my students. I’m not exactly a theater person — I appreciate plays and musicals, but the idea of orchestrating a whole production is definitely something new for me. But, because I’m passionate about the subject matter, I find myself so much more willing to devote the time and effort to taking a creative risk in my teaching. This has gotten me thinking about what is lost as teachers are increasingly encouraged, in my opinion, to move away from creative approaches in the classroom in favor of increased standardization because of the ever-increasing demands of accountability. Creative enterprises, like my Lorax show, can fit within the standards being delineated by districts and the federal Common Core initiative. But, if teachers aren’t actively encouraged to cultivate their passions and to use the energy they feel about those topics to engage in risk-taking, I feel like we might miss out on the facilitation of some exceptionally memorable and meaningful educational experiences for their students. I feel fortunate to be in a setting where I can take these creative risks and be supported in doing so, and hope that I will continue to be as long as I stay in the classroom! So, this week, I’m diving in. My students and I will be working on a script for our play and deciding what characters to include. Their excitement about this project already seems boundless, and I am eager to work with them on a long-term project that will help them develop academic skills, but also, give them a chance to apply so many of the character skills that we’ve been working on cultivating throughout the year. I think it will be valuable for my second graders to work on something that is long-term and hard, that will undoubtedly involve mistakes and maybe crises, and that will push them out of their comfort zones. Stay tuned! I’ve spent a good chunk of time this evening working on revamping the layout for the blog that I maintain with my students. Specifically, I’ve been creating a new header image for the blog, which will be the first thing that all visitors see when they visit our site. 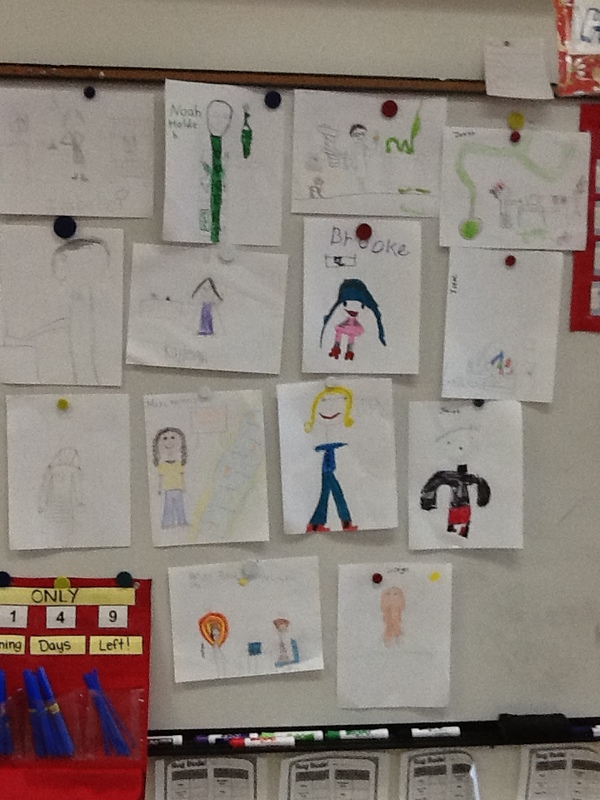 Originally, I intended to teach my students a lesson about what murals are, invite them to create their own, and then have them vote for which drawing would represent our classroom on the blog. However, after all of my students were captivated by my Prezi on murals and spent a sustained amount of time working on their own, I simply couldn’t resist incorporating them all. 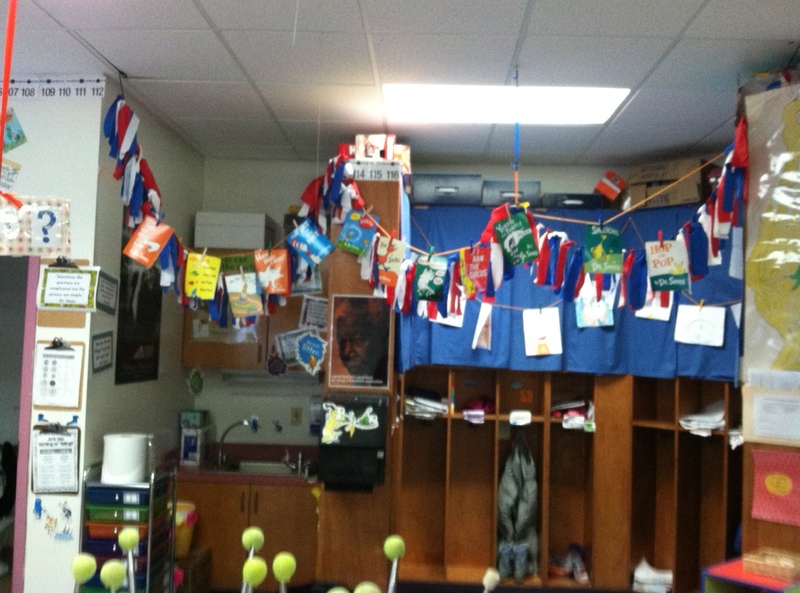 I also love how including something from each of the students reflect a cohesive classroom culture. I cannot wait to share this with my students when we update our blog this week. I know that they will be so thrilled to see their artwork displayed so authentically. We haven’t updated our blog too many times yet this year, but I have found introducing blogging to young kids to be so magical. They are amazed that they can write something and have it be published and shared. 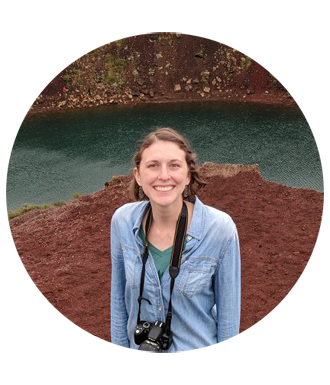 Our blog was one of the greatest successes (and most frequently student-cited favorite parts) last year, and I am expecting even better things this year. Right now my focus is on trying to get parents to check our blog regularly — it is such a powerful tool for sharing not only what is going on at school, but allowing parents to see student work. I also want to work towards having my second graders have greater autonomy over posts — toward the end of the year last year, students were typing the posts, but I am hoping to find ways to have them generating content more independently this year. Do you blog with your students? How do your students like the experience? As I worked on approaching my second year in the classroom, I spent a lot of time thinking about how to create more authentic learning experiences for my students. Last year, the richest experiences in my classroom were, by far, those instances where my students were able to see the relevancy of what they were learning by having an experience where they could apply their learning to the real-world. To that end, I’ve been working on brainstorming authentic projects for my students — the first major one will take place in November, when we put our map and interview skills to use to create a guidebook for our school. Later in the year, in our advertising and money unit, my students will develop, create, and market an invention to “sell” during an invention fair with their parents. These activities do involve a lot of effort on my part, but the rewards are well worth it. I was reminded and re-motivated in this area last Friday, when we went on a field trip to a local agricultural fair. I put three students in my group who I felt I hadn’t connected with on a personal level yet. One of these students is a learner who has long struggled in school. During the trip, it was fascinating to spend time with him. While he is usually reserved in our classroom and rarely volunteers (and is sometimes prone to misbehavior), on the trip he was engaged and very expressive. His vocabulary as we walked through the animal barns blew me away — I had no idea he had such an expansive grasp of language. Even more impressive were his actions toward his groupmates — he was keeping an eye on them and making sure they didn’t get lost. At one point, he even held their hands to make sure they stayed together in a particularly crowded section of the fair. This experience led to me seeing my student in an entirely different light and allowed me to see him exhibiting skills that no typical classroom experience was likely to draw out of him. 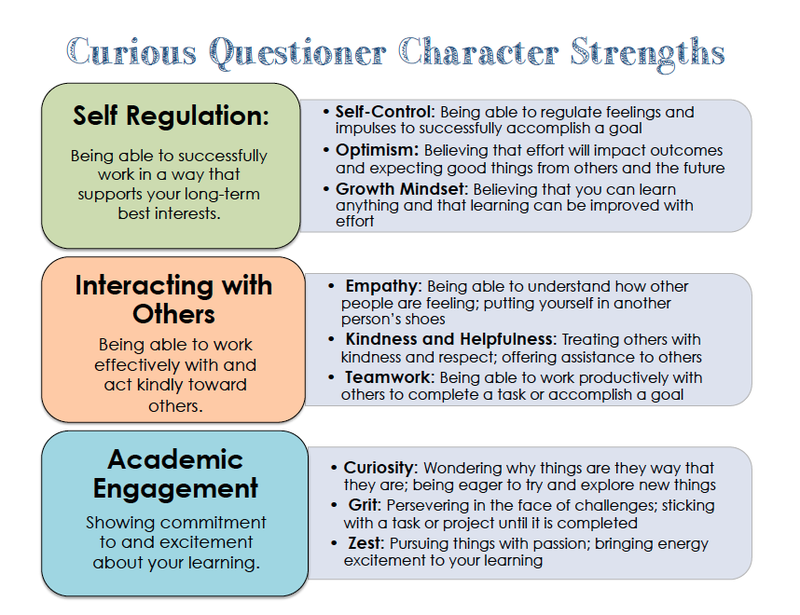 Since then, I’ve been thinking a lot about how I can provide these types of experiences to all of my students — I know that, for many students, the classroom can be a threatening place in its traditional form, with its emphasis on a single correct answer and rote-type activities. I really think that by giving authentic, “in-context” learning opportunities, more of my students will rise to the occasion. It seems like a way to truly illustrate a belief that I so strongly hold: that all students can be successful learners when given the right tools and motivating activities that allow them to apply their learning and skills in a “real” way. Fellow teachers, what types of authentic learning activities do you do with your students? I would love to hear about any projects that have proven particularly motivating and effective! Somehow, it’s really coming — the end of the school year, that once seemed so far away, is now approaching at a blistering speed. We have only seven days left at my school — but one of them is our field day and another is just a half day. So, we’re really down to the wire. I’ve been trying to think about how I can bring closure to what has been an up-and-down year — but I’m already recognizing that things probably won’t tie together with the neat bow that I would choose if I had it my way. Books You Can’t Leave Second Grade Without Knowing About! : I started this activity this past Monday, and my students are loving it. I am a children’s literature enthusiast, and I found myself getting very frustrated that I couldn’t make certain outstanding books “fit” with what we were studying throughout the year. So, I’ve started a countdown of the best 10 books that we haven’t read this year. Each day, I read a new one to my students — their attention and conversations following the stories have been impressive and quite sophisticated. They especially enjoyed “Wilma Unlimited,” which I read earlier this week. Portfolio Browsing: Next week, my students will review all of the work that they’ve put into their portfolios this year. They will choose three pieces that reflect “best effort work” and will justify their selections. 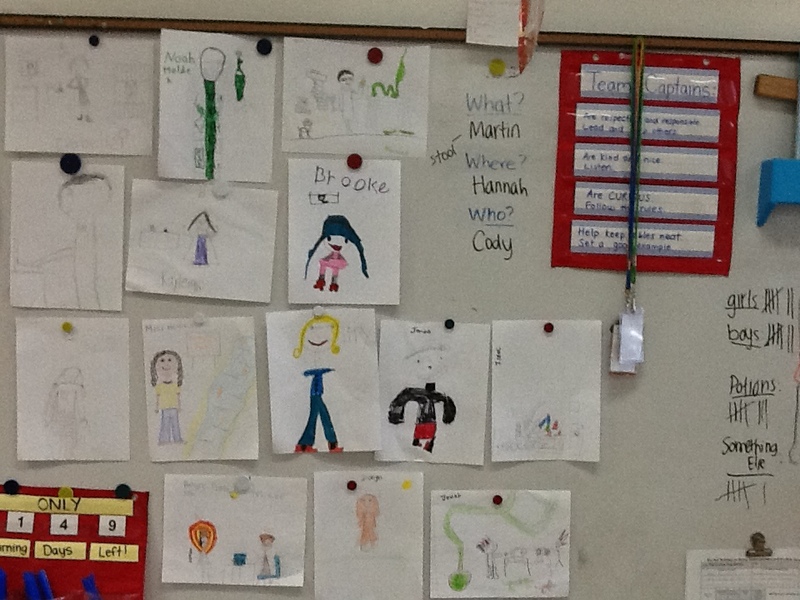 I am eager to see what they choose and how they will reflect upon and describe their hard work. Letters to Next Year’s Students: I don’t know where I first came across this idea, but I think it’s a nice way to recognize successful completion of the year and to “pass the torch” of their acquired expertise to the students who will follow them. I am very excited to see what my students choose to include as advice for next year’s students! Choosing Adjectives: To make sure that all feedback on their performance this year isn’t coming from me, I am going to have my students work together as a class to choose a positive adjective that describes each of their peers. I expect that seeing all the ways in which their peers see them will have a big impact on my students. Too often, kids, like adults, often focus on the negative, so it is my hope that this activity will leave them thinking positive thoughts about each other. 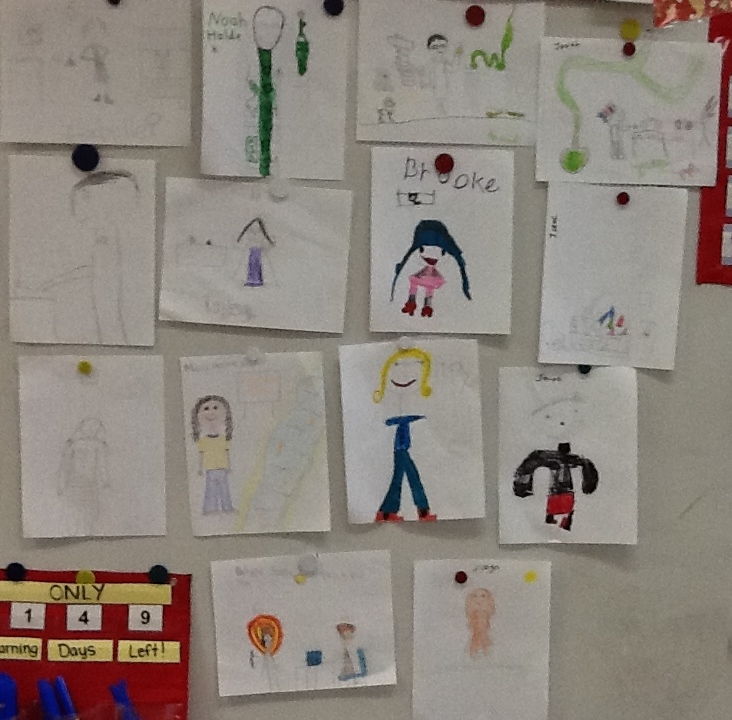 Blog Review and Slideshow: I am so happy that I had my students keep a blog this year. It was a great opportunity for them to have authentic writing experiences and to engage with a real-world audience. Additionally, it will serve as a kind of scrapbook of our year. We’ll be able to look through all of our old entries, look at our photos, and watch the videos to relive the school year. I think it will be wonderful! 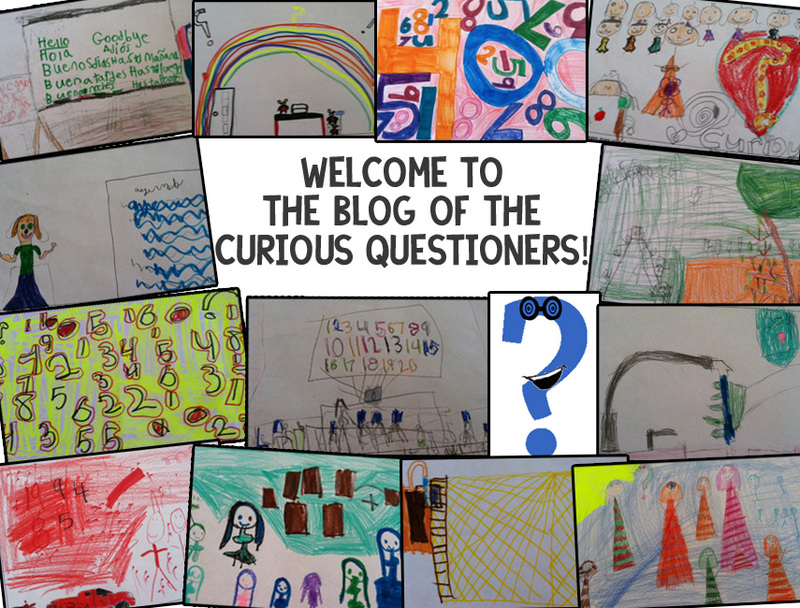 Curious Questioner Certificates: On our last half day, each student will receive a certificate. I have worked very hard to choose accolades that aren’t specifically tied to academics, but rather to positive qualities that each student exhibited during the year. 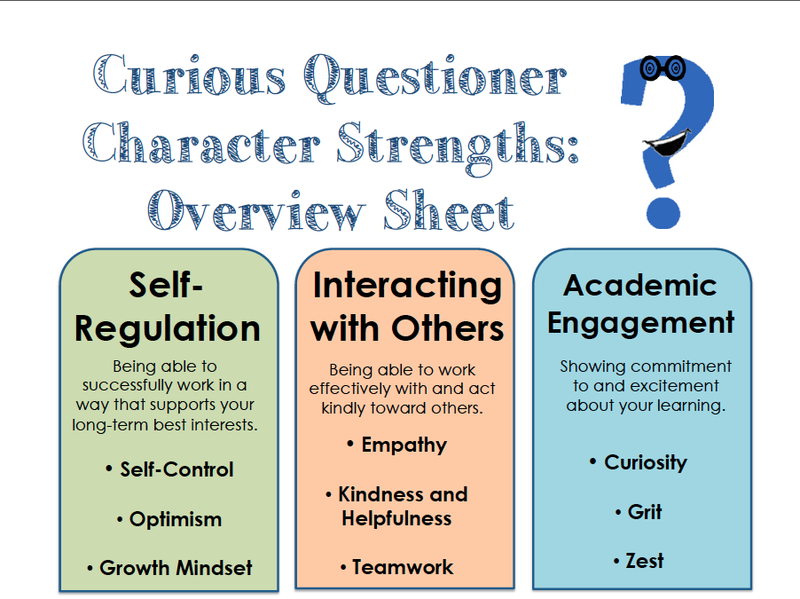 This way, hopefully students will really take home the message that character is just as — if not more — important than academic ability. Special Books: As their sendoff into summer and end-of-year gifts, each student will get a book from me — carefully chosen to reflect his or her interests. I hope that these will be “special books” that my students will keep on their shelves long after second grade. It is so odd to think about wrapping up the year. I know that no matter how much more time we had together, I would still have this feeling on seeing them leave that “there is so much more that I want to say to you.” I can already tell that I do not like the end of the school year! What do you do to make the end of the year special for your students? Do you have any year-end traditions? This week has been … heavy. Things have seemed chaotic in my classroom, as many of my students have some pretty serious out-of-school stuff going on that is almost completely out of my control. I am spent emotionally and physically. Luckily, because I live in Maine, somehow the first day of spring has brought me a much needed mental-health-snow-day. With all of my frustration and sadness for my kiddos, I am so grateful that I am teaching a topic that I love right now and not having to trudge along through some required learning about which I’m not completely stoked. 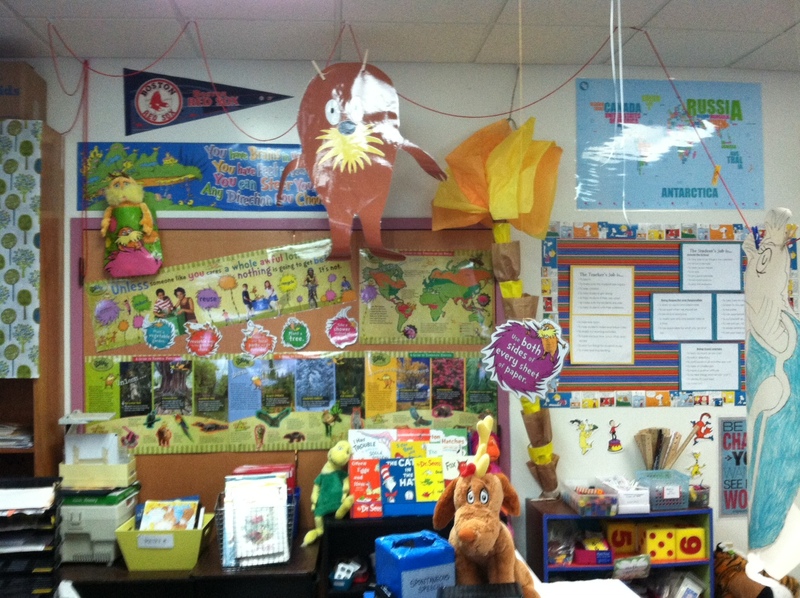 Two weekends ago, I had an army of helpers who brought a Seussian makeover to my classroom. 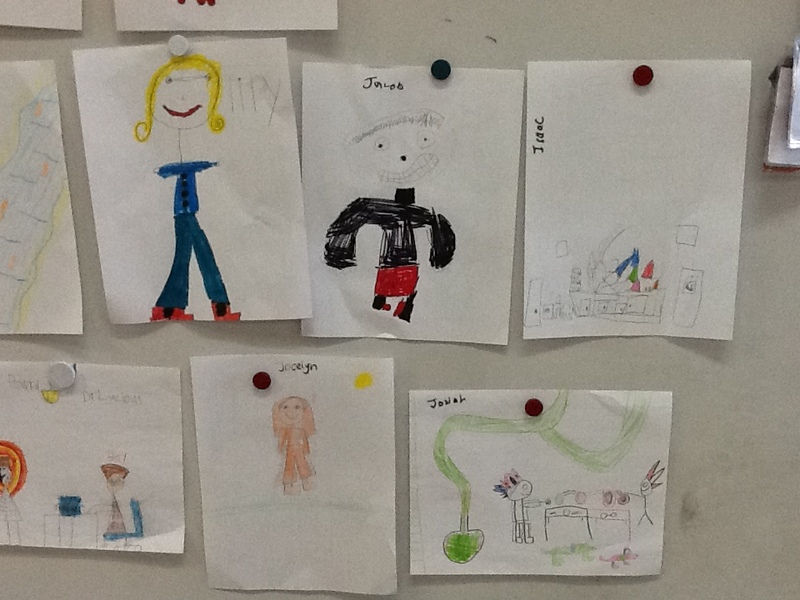 So far in our unit, we’ve been learning about poetry and imagination. 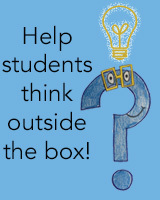 My students and I did an activity around the book “Not a Box” and they also dreamed up some crazy inventions to help them address a problem in their house for homework. 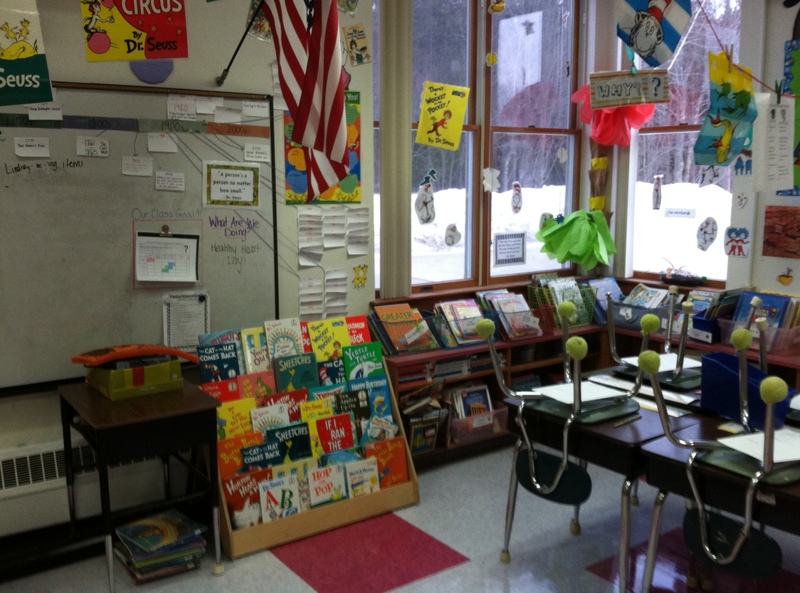 Tomorrow, my school is having an all-school read-a-thon event and in my classroom, we are having a marathon Seuss read aloud. I have friends and parents coming in to share their favorite Seuss books from 10-5. I am really excited about this and my students cannot wait! Next week we are jumping into exploring Civil Rights with The Sneetches and then we’ll be studying the environment with The Lorax. Stay tuned for future posts — this is the unit that I’ve been planning for and excited about all year long!